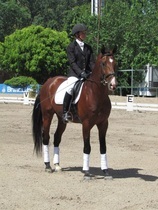 Dressage is the highest expression of horse training. It consists of making a series of exercises together, walk, trot and canter. It improves balance and helps developing horse’s muscle mass so it can respond naturally to the rider's aids. It is a valuable complement to achieve greater connection to the binomial for equestrian sports and higher performance. It is one of the three equestrian disciplines that are part of the Olympic Games, along with Shoejumping and Eventing. It is considered the most artistic of the three.